Citation Information: J Clin Invest. 2016;126(11):4372-4386. https://doi.org/10.1172/JCI81993. Obese, insulin-resistant states are characterized by a paradoxical pathogenic condition in which the liver appears to be selectively insulin resistant. Specifically, insulin fails to suppress glucose production, yet successfully stimulates de novo lipogenesis. The mechanisms underlying this dysregulation remain controversial. Here, we hypothesized that carbohydrate-responsive element-binding protein (ChREBP), a transcriptional activator of glycolytic and lipogenic genes, plays a central role in this paradox. 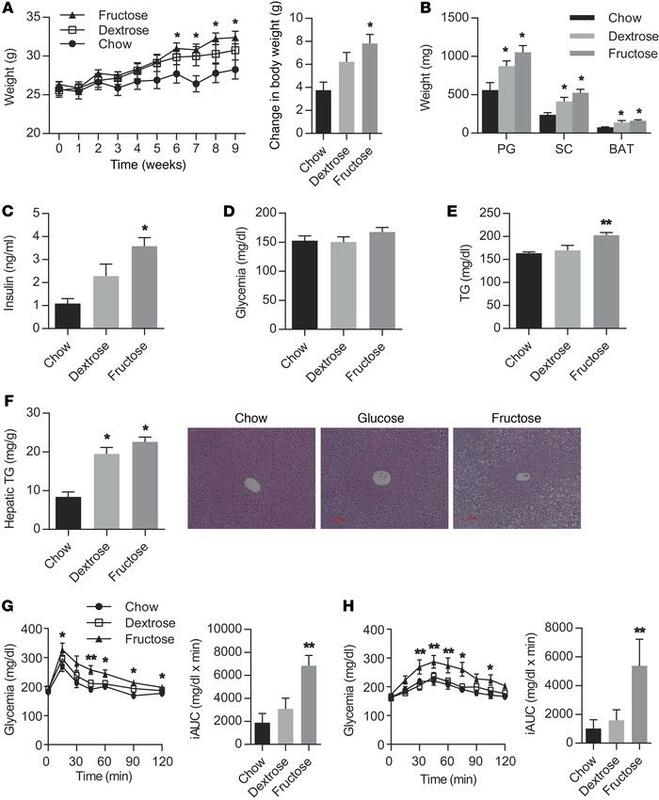 Administration of fructose increased hepatic hexose-phosphate levels, activated ChREBP, and caused glucose intolerance, hyperinsulinemia, hypertriglyceridemia, and hepatic steatosis in mice. Activation of ChREBP was required for the increased expression of glycolytic and lipogenic genes as well as glucose-6-phosphatase (G6pc) that was associated with the effects of fructose administration. We found that fructose-induced G6PC activity is a major determinant of hepatic glucose production and reduces hepatic glucose-6-phosphate levels to complete a homeostatic loop. Moreover, fructose activated ChREBP and induced G6pc in the absence of Foxo1a, indicating that carbohydrate-induced activation of ChREBP and G6PC dominates over the suppressive effects of insulin to enhance glucose production. This ChREBP/G6PC signaling axis is conserved in humans. Together, these findings support a carbohydrate-mediated, ChREBP-driven mechanism that contributes to hepatic insulin resistance. High-fructose feeding induces metabolic disease. (A) Body weight and (B) fat pad weights (PG, perigonadal; SC, subcutaneous; BAT, brown adipose tissue) were measured in WT male mice fed chow, high-dextrose, or high-fructose diet for 9 weeks (n = 8 per group). (C) Glycemia and (D) serum insulin were measured in the ad libitum–fed state. (E) Serum triglyceride (TG) levels were measured after an overnight fast followed by 3 hours refeeding with chow, glucose, or fructose diet. (F) Hepatic TG levels and representative H&E-stained liver sections. Images were obtained at ×20 magnification. (G) Glucose tolerance test and (H) glycerol tolerance test with incremental areas under the curve (Δ AUC) for this cohort. P values were obtained by 1-way ANOVA. *P < 0.05 versus chow; **P < 0.05 versus all others. Values are the mean ± SEM.